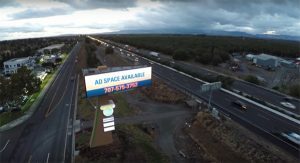 If you want to have one of the best billboards in Vacaville, contact the experts at Veale Outdoor Advertising, who have been leading the industry since the 1980s. Your business, event, or cause can broadcast its message to thousands of people each day by grabbing the attention of commuters and passers-by. Our top billboards are attention-grabbing and inspire viewers to take action. You can choose one of our traditional static billboards or one of our state of the art digital billboards. We can help you secure one of the best billboards in Vacaville, and we’re even experienced in helping small, local businesses. No business is too small to have one of the area’s top billboards. Your message can be broadcast locally, regionally, or nationally, reaching a larger audience than you ever imagined. Radio and television audiences are limited to the listeners and viewers of those stations, but a substantially larger and more diverse audience sees a billboard. Commuters will easily be informed of your message. We have a long history of supplying static billboard space, but now we offer digital billboards that have a variety of advantages. For example, the message on a digital billboard can be updated as often as you need. If your business has a weekly sales event, you can modify your billboard’s message as needed for each week’s sale. Contact Veale Outdoor Advertising today to learn more about how the best billboards have been helping other Vacaville business, events, and causes. We will work directly with you to understand your needs and specific message. We look forward to helping you take your business to the next level.